A beautiful single and a great excuse to revisit Dad Rocks! As a member of Mimas and in his solo guise Dad Rocks!, Snævar Njáll Albertsson is responsible for some of the most gorgeous music that you may never have heard. Forget the melancholic folksy stuff from the US, Albertsson is the one that everyone should really be getting excited about. 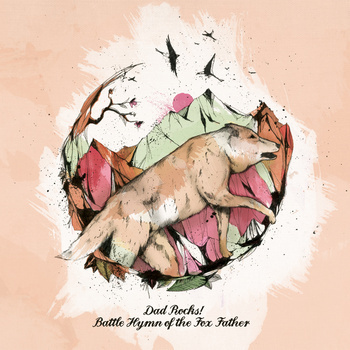 As demonstrated by current single 'Battle Hymn Of The Fox Father', the central piece to last year's critically acclaimed Dad Rocks! album Mount Modern. Beginning with an acoustic guitar and a simple rhythm, delicate instrumentation is built upon layer by layer with Albertsson's voice becoming the gorgeous central focus. There's a folk root to the song, but with the bass part moving around in the song and quiet brass assisting in the swells, Dad Rocks! creates his own sound and completely inhabits it. Marching drums accompanied by a trumpet and fleshed out by twinkling pianos give an almost festive feel, while the overall arrangement is warm and inviting. Like watching the snow fall on a dark evening from the safety of yr kitchen window, listening to 'Battle Hymn..' allows you to feel better being on the inside. Accompanying the single for free download is a remix by Snow Kite. Burying the vocals beneath fuzz, the repetition of the piano line is bought to the fore and accentuated. If the studio version is watching the snow fall from the window, the introduction to this remix is like trudging through the flakes. Prior to the end of the first third the fuzz is cleaned up, leaving the vocal distant and hazy. An electronic beat replaces Dad Rocks! arrangements with fragments from the original occasionally intruding. At over six minutes the remix is arguably overlong but saved by progressing through different textures to a more than satisfying conclusion.